Some clients may prefer that you not to show their real name publicily. Here, you can specify a short description which will be used instead of client name, logo, website. Companies with verified proof are 3X more likely to be contacted by potential clients. Unverified clients can't count towards your Proven ranking. NOTE: We never use your client contact details for any purpose except to verify your relationship with them. Hybrid Steel Design started as a way for Owner, Welder, and Fabricator Levi Clark to give back to his home town in Geraldine Montana! Starting out providing mobile welding and fabrication services to the local farmers and ranchers and growing into a business that services Montana's overall Agricultural needs. Including but not limited to welding, fabrication and millwright services providing a quality end product you can trust!! We provide quality service while adding value to our projects. We think out of the box and have the creativity to problem solve efficiently and onsite. We are team players and make sure our customers have consistent contact so that they can trust the process and know they are getting the best service! Hybrid Steel Design was the General Contractor who completed the inside portions of the Pardue Grain Facility. Assembling all of the components, robotics, and equipment. We also provided on the spot welding and fabrication for all the transitions, stands, ladders, platforms etc. We did so with a passion for the project and providing the best quality for an amazing end product. 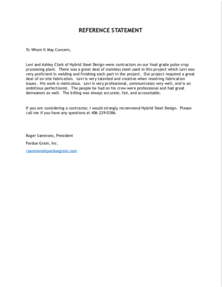 Please see Reference statement from Roger Sammons.